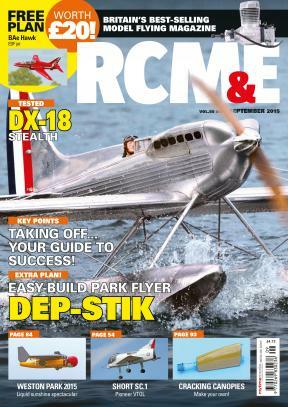 Catering for all aspects of R/C flying, Radio Control Models and Electronics first appeared in May 1960 and is the biggest and best selling monthly model flying magazine in the United Kingdom with a large overseas readership. RCM&E has brought benchmark levels of writing and photography to the hobby and each issue has extensive reviews, informative features and opinionated columns from a number of well-known contributors. With every Print issue you'll find a high-quality free plan along with an accompanying build article. RCM&E publishes 13 great issues a year. PLEASE NOTE THAT THE DIGITAL SUBSCRIPTION TO THIS MAGAZINE DOES NOT INCLUDE THE FREE PLAN. I was recently asked why I love R/C flying so much. The answer is simple. I love it because it’s challenging, rewarding, exhilarating and allows me make new friends while indulging my passion for aviation, electronics, design and gear; it gives me great stories to share and it’s a world that’s constantly changing too. You’ll find all of this within the pages of RCM&E – it’s the only magazine that understands and delivers the passion that makes you want to fly.